I am pretty sure every baker wants to try out just abt any kinda cake especially if the cake looks pretty and ohhhh so so good.. i am a sucker for that.. be it when i'm in a bookstore browsing thru cookbooks or browsing thru food websites... the first thing i look at is the pic.. a cookbook without any pics is to me.. nothing.. i dont even wanna bother browsing thru it in the first place.. Overall it was a good experience eventho i was dissapointed with the taste.. we are sweet ppl so this kinda cake will never be our fav.. maybe if i add sugar to my whipping cream i might like it or even drizzle more dulche de leche on every layer..who knows..
1. Beat the butter with sugar until light and fluffy. 2. Beat eggs, add to the butter mixture and beat until combined. 3. Pour the milk, stir well. 4. Add about 150 g of flour mixed with baking powder and beat until smooth. Slowly add the remaining flour to form a stiff dough. Don't worry about how much flour it ends up being, just keep adding until the dough is not sticky anymore. Cover with plastic wrap and set aside in a warm place for about 30 minutes. 5. Divide the dough into 20 equal portions... (i weigh .. each abt 75g) Lightly flour the surface and the rolling pin. Roll out the dough until it makes as thin as a crepe. 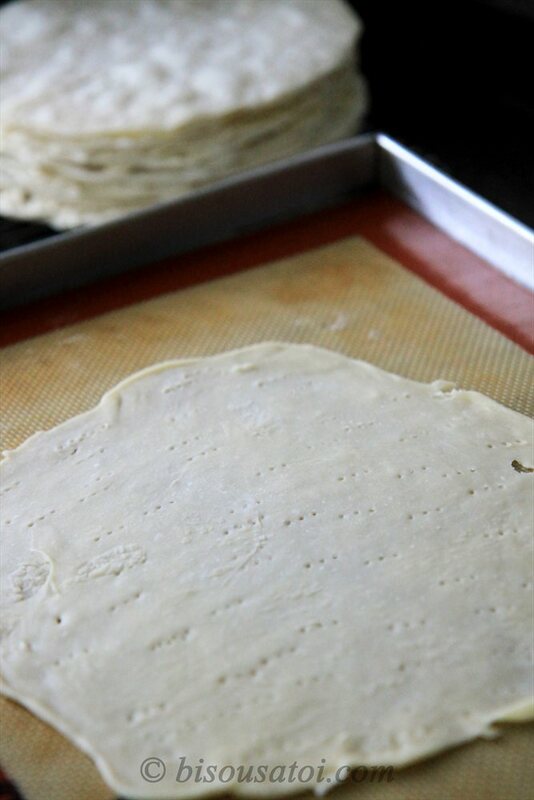 Poke the dough with a fork to prevent bubbles from forming while baking. Bake at temperature 170-180 С for 4-5 minutes. Cut out equal circles from each baked “crepe”. Leave the cuttings for decoration. 1. Beat the eggs with starch until combined. Put milk in a heavy-bottomed pot over medium heat. Add the eggs mixture into the warm milk. Low the heat and cook stirring constantly to prevent scorching for about 10 minutes or until thickened. Let it cool for a little bit. 2. Add the boiled condensed milk. Stir well. Cool. Add the whipped heavy cream and stir again. Each layer coat with the cream (about 4 tbsp). The top layer and the sides coat with the cream too. Decorate with the remains of the cake. Cool at least 6-8 hours. I am gonna go now.. theres no real cake for us to munch with coffee and am planning to bake something quick n simple.. cake with banana and chocolate.. yumms! Rima, nampak lawa, tetapi memang la nampak tak sedap. Baik la lapis tu di isi dengan isi curry puff dan goreng selepas disalut telur, lagi la sedap. Tak per la, buat perhiasasan blog u.
i salute you! This is awesome! Waaaaah, padahal cake ini sudah lama masuk di 'to do' listku kak Rima. Tapi kalo rasanya tak secantik picturenya tak usahlah dibikin...hihi tak jadi saja. Untung juga aku belum bikin ya? Tapi kalau isinya ganache cokelat kira kira enak tak kak Rima?? Long time no hear ya..but I've been visiting you every possible time. don't really go for too sweet cake. Ty for visiting.. if ur not into sweet thang.. this will probably be ur next to do cake.. bake it and lemme know if u like it yah..
Sudah didalam kepala otak ku mahu buat semacam begini lagi.. maybe i will just buy ready made crepes (cos malas mau guling guling) and instead of milk cream .. i will use either nutella ganache or just chocolate ganache as fillings.. that way rasa nye sudah tentu enak..
LOL .. ya ado.. memang dah lama pun tak melapis but kan melapis kek lapis lagi shiok.. yg ini nak kena roll roll.. ponat .. 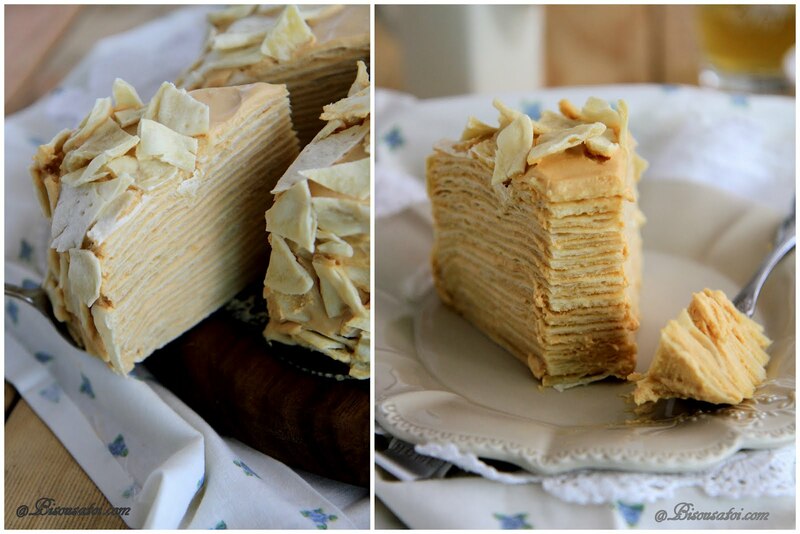 I've been dreaming to make this for months.. Ala choc crepe cake kan? I WILL try this ASAP.. he he tq for sharing it..!! hehehe...Babe ok I got it now..this is the place to comment..hahaha..
cake still looks v good indeed even tho' u said tak sedap..but so much hard work la..this cake reminds me of the 'tree bark' cake..i forgot the name la. but it's not the same kan? Rasa dia macam wrap.. Bila ku roll ku wished I know how to tibar macam buat roti Prata.. Sure cepat habis.. Tak per.. I will do it again.. With extra sugar but kan I don't hv anymore dulche de leche.. Only bought 2 cans while in barca cos masa tu last day there n hubs dah warning our luggage dah over the limit.. One more thing.. Last night hubs try n he said something was a little off.. I suspected the cream.. Tu yg buat ku nak mencuba it again..
Eh, you tak perasan ke? everytime I masuk blog you, punch tab reward me some points! he he redeemable points..tu lam rewards kat below bar..
That one is like crepe kan.. this one texture dia lain .. tak macam crepe pun.. more to dough tu sebab harus diroll bef u bake it in the oven.. bila dah siap tu.. ruper dia akan akan "wrap"..
caya lah sis.... cun !!!! Rima, i dont think i am as patient as you. 20 times? bukan main lah. Jane tak pandai macam Rima. Nanti after 20 times masuk bin pula...haha... Jane duduk sini tunggu makan dah lah.